I want to say a big *Thank You* to Barbara Grainger for writing one of my favorite beading books: 'Dimensional Flowers, Leaves & Vines'. It's always the first book I'm referring to every time I'm playing around with leaves and flowers and it's from this book that I learnt the technique for the leaves and petals I used in this necklace. 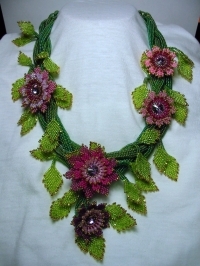 I also want to say *Merci Beaucoup*to Frany for asking me to make a flowers swap with her. It's because of this swap that I pushed myself to figure out how to make these flowers (I made an orange/yellow set for her) and a way to mount them on a necklace that 'd be different from hers in style. Frany uses a wire inside of her ropes and attaches the flowers at the end of the ropes. I wanted my flowers to stay up, but without using any wire. Now that this one is done, I can play with the beautiful flowers that she made for me and see what I can do with them. C'est la vérité! :-) Moi aussi je suis trés content de te connaître! Thank you so much, Eliza! I miss you too! I wish you didn't have to go so far away, but I'm happy to know that you have a much better life down there. This website is very easy! I have a control panel with all the tools to work on it and it's mostly just 'Cut and Paste'. If you need help, just email me and I can help you. You can try a 7 days free trial to see if you like it. Just click at the bottom of any of my pages. Wow.....you have certainly gotten a lot better over the last year or so I am amazed really. The colors are excellent and I love the design. never thought I would get into beaded jewlery but you have enver made any thing I would not wear my self. God truly has blessed you with many gifts....glad to see the beading is going great. The garden will fall into place with time hey if anything you could bead on hell of one. I'll be visiting your site as soon as I'm done updating my blog! Takes my breathe away! This is simple over the top GRAND! Can't wait to see the other two! I know I won;t be disappointed! Keep Beading Girl! Ce collier est superbe ! Quel beau travail ! thank you for your comments on my blog, which help me to discover your website, Your flowers are so beautiful! I put your link on my blog if you don't mine. Thank you for visiting my site and for your kind words about my flowers. Of course I don't mind to be on your links list! Thank you!